Vea is to be presented the Morris Trophy this afternoon at the Washington Athletic Club. Washington defensive lineman Vita Vea is projected to go to the Dallas Cowboys with the 19th overall pick in the first round, according to the year’s first NFL mock draft produced by ESPN’s Mel Kiper. 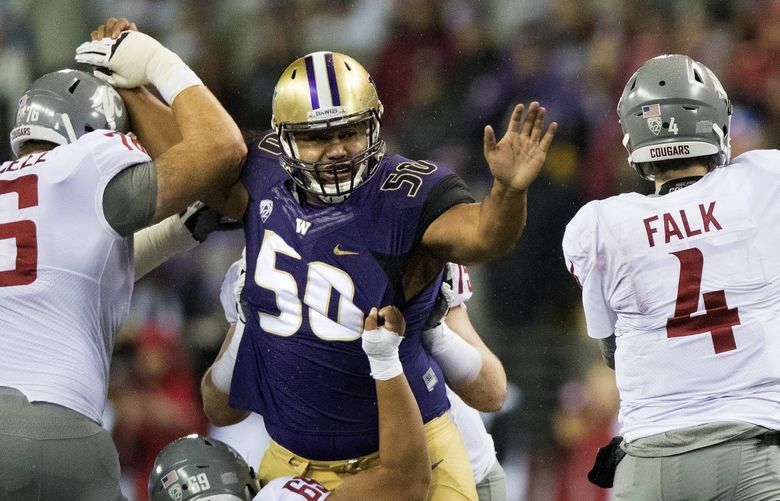 A junior from Milpitas, Calif., Vea anchored a UW defense that ranked as the best in the Pac-12 for the third straight year. The 340-pound lineman had 44 tackles, 5.5 tackles for loss, 3.5 sacks and four pass breakups in 2017, when he was named the Pac-12 Pat Tillman Defensive Player of the Year. He is the first Husky to win the league’s defensive player of the year award since Jason Chorak in 1996. Vea was also named to the all-Pac-12 first-team defense and, in a vote of Pac-12 players, was named the winner of the Morris Trophy, presented to the league’s top defensive lineman. He’s UW’s first Morris Trophy winner on defense since D’Marco Farr in 1993. The Morris Trophy presentation is scheduled for this afternoon in Seattle at the Washington Athletic Club. The draft begins April 26.